CSSIgniter Shortcodes is a plugin originally created to complement CSSIgniter's premium and free themes. However, anyone can use it with any theme. All themes available on MagicPress that support it come with the plugin preinstalled and activated. This plugin provides a wide variety of shortcodes, that can replace or complement multiple HTML elements, such as buttons, boxes, lists etc. There are also shortcodes made to give you functionality such as image sliders, accordions and embedding maps. The CSSIgniter Shortcodes settings can be accessed at Settings > CSSIgniter Shortcodes in your WordPress dashboard. 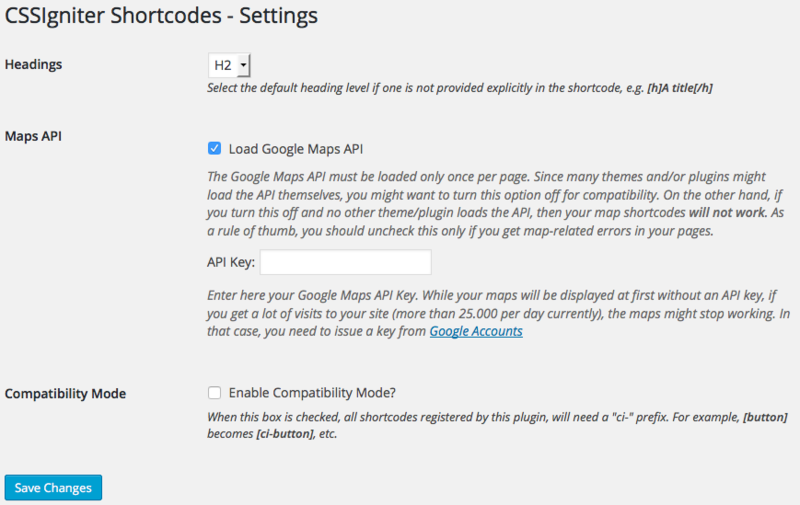 You can specify which HTML heading is the default one for the Headings shortcodes, choose whether you want to load the Google Maps API and enable or disable Compatibility Mode (useful if you’ve installed other plugins that might use the same shortcodes as CSSIgniter Shortcodes). This shortcode will give the following result. which will produce the following button. The plugin contains inline help under its settings page. Just go under Settings > CSSIgniter Shortcodes. For detailed information on how to use CSSIgniter Shortcodes, you can check the official documentation.